Thenmala is an eco-tourism project conceived by the Kerala government to save the precious bio-resources near Punalur town in Kollam district of Kerala. When it was conceived, it became the first planned eco-tourism destination in the whole country. This project is part of a water reservoir built across the Kallada River. A dam was built across this river some years back to generate the reservoir for various purposes in the region. Thenmala eco-tourism project has become the shooting sites for movies. 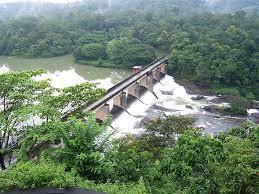 In reality, Thenmala is a small village hamlet on the western side of the Kollam district. The name of the place has come from one of the finest occupations prevalent in this part of the world. People in this picturesque place take up the rearing of honey bees in their hives. Being close to the Western Ghats mountain range, it has a unique climate that breeds healthy honey bees. Hence, the honey made in this location has superior taste and longer shelf life. This is the reason the place is called Thenmala. In English, it means honey oozing mountain!! Since it is a beautiful place, Thenmala also attracts both foreign and domestic tourists who visit the southern part of Kerala. It is approachable from Thrivuananthapuram and Punalur by road. This eco-tourism project is taken care of by Thenmala Eco-tourism Promotional Society, which is an undertaking of the Government of Kerala. The government of Kerala undertaking is providing awareness classes for the visitors to make them understand the significance and necessity of eco-friendly measures to sustain the environment for the future generation. Once the visitors enter the project area, they would be guided by the experienced and qualified guides, signboards, information boards and direction pointers to lead people to different locations in the ecological park. Do not miss out a chance to visit this beautiful place to savour its beauty and cool the agitated mind. The eco-tourism project provides equal opportunities for leisure, fun, adventure and learning. Roughly, the project area is divided into different zones that deal with a specific theme. They are cultural, adventure and leisure zones. Find below the brief descriptions about these zones and what visitors can expect there. Adventure Zone: The adventure seekers can go for trekking, mountaineering and biking to explore some of the beautiful parts of this eco-tourism project. They can also even go for boating in the lake and rope-walking over it. Cultural Zone: In this zone, people can go and watch the dancing and the lighting fountain in the evening when it becomes darker. There are restaurants where people can go to relish the traditional Kerala cuisine. While roaming in this zone, they can even peek into the state's art and culture centre. Then there is an amphitheater where some program keeps happening to entertain the audience. The Tourism Felicitation Centre in this zone provides much needed information about various locations where the visitors can fan out in the day. Leisure Zone: People visiting this zone can try boardwalk to reach the dam site with ease. There is Sway Bridge that enthrals people from all age groups, especially children. For the benefit of people with artistic bend of mind, there is a sculpture garden with Man and Nature theme. 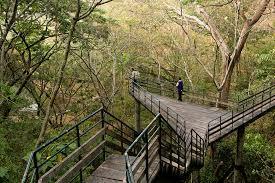 Apart from the main attractions, there are other places near the ecological reserve where people should go to savour the full beauty of the place. A visit to these places would not let people down as they get an opportunity to become part of nature. We have listed some of them for the benefit of the readers. Palaruvi: People visiting this place can even go to the Palaruvi Waterfall, which is nearby. This beautiful waterfall is about 16 kilometres from the eco-tourism project. Rehabilitation Centre: The place is also famous for a deer rehabilitation centre. The visitors to this place can see the deer in their natural settings. The centre also has a traditional house made on the top of a tree. This tree house was used by people living in forest areas in olden times to escape from wild animals. Nedumpara: This is a scenic place located at a distance of 7 kilometres from Thenmala Eco-tourism Park. Noted plantation group in the state Harrisons Malayalam Limited has a rubber estate in this place. The group has named it as Isfield Estate. Nedumpara Motta: It is a peak located near a small village near this rubber plantation. This place is also home to other establishments. They include Players Cricket Team and NSAC Football Academy. The sports enthusiasts can visit these facilities to quench their desire to play these games during their leisure times. Another beautiful place to visit near Thenmala is Ambanad hills. This geographical formation is situated at a distance of just 8 kilometres from Nedumpara. The tourists can also think of going to places such as Kulathupuzha, Kamukumchery, Anchal, and Courtalam waterfall and Sengottai in neighbouring Tirunelveli district of southern Tamil Nadu. Thenmala is a beautiful habitat where tourists seek respite from summer heat. The area is blessed with rich flora and fauna. The region is known for sericulture. The honey made in hives from this place is very famous for its texture, taste and quality. This is the reason why it is called as Thenmala. On entering the premises, the visitors would be guided through all the important locations by well qualified guides and other sign boards. People can undertake the adventure activities and spend some leisure time in the backdrop of the Western Ghats at the dam site. This view provides an unmatchable view of the horizon from the dam. Then there other places such as Kulathupuzha, Courthalam, Sengottai and Sendurunai Wildlife Sanctuary where one can get a similar kind of settings for a comfortable outing. Armed with this information, let us pick our backpacks and move towards the true heavens found on earth.